Brief: Produce a short film based on both a subjective point-of-view and an objective view. The aim of this project film was to put into practice what I had learnt about framing and camera angle, by making two shots, one subjective and the other objective, and combining them into a finished film. I began by looking for examples of subjective pov shots in films and discovered that it has been used since the early days of cinema. 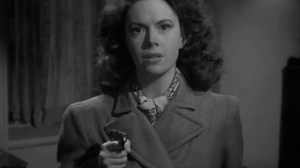 One notable example is the film noir Lady in the Lake (1947). Shot entirely from the first person perspective of the main protagonist, private detective Philip Marlowe, who is hired by a wealthy businessman to find his estranged wife. Using the subjective pov to represent the main protagonist’s perspective in this way, the film breaks with the convention of the ‘fourth wall’ in allowing the audience to assume the role of the protagonist, seeing the action through his eyes. The viewer only catches glimpses of him in reflections and mirrors. All the other characters talk directly to the camera. 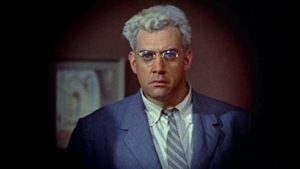 Hitchcock uses subjective pov to great effect in Rear Window (1954) and Vertigo (1958). The subjective pov shots in Rear Window enhance the voyeuristic nature of the film. Confined to a wheelchair due to a broken leg, photographer Jeff Jeffries watches his neighbours through his camera. This is the view through which he observes and interprets events throughout the film. It is also a view that feeds into the main protagonist’s paranoia. A subjective pov is also used from the perspective of Thorwald, the suspect, towards the end of the film, when he is repeatedly blinded by Jeffries’ flash bulbs in the darkened apartment. 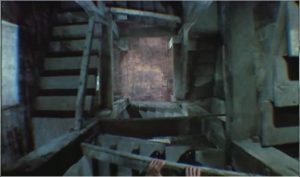 Hitchcock also uses subjective pov in Vertigo to represent the main protagonist, Scottie Ferguson’s, fear of heights in the scene in the Mission San Juan Bautista, when he stops on the tower steps and sees Madeleine fall to her death. Subjective pov is used to shocking effect in the long opening shot of Halloween (1978). 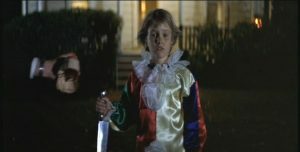 Handheld subjective pov shots from the perspective of the protagonist are used in the opening scene of Halloween. This helps to portray the character’s deranged state of mind. The viewer is seeing the action through the killer’s eyes, watching through the window, going into the house, getting the knife, going upstairs and killing the girl. It also helps to conceal the character’s identity in the opening scene and raise tension whenever we encounter the subjective pov later in the film. A similar approach is adopted in The Teminator (1984), in which the viewer sees through the eyes of a cyborg assassin sent back in time to kill Sarah Connor. 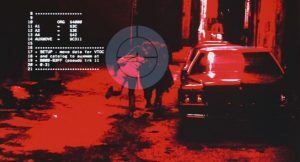 Several scenes in The Terminator are shot with an optical pov that resembles a HUD with a transparent data display. Seen from the perspective of the assassin, the viewer is reminded of the mechanical nature of the cyborg and its lack of humanity. Looking at examples of subjective pov like these was helpful in showing how it can be used to good effect within a scene. Particularly, when used alongside objective views, how it can be used to generate suspense and raise tension at key moments within a film. Before shooting this sequence, I spent some time visualising the subjective pov shot and preparing a storyboard outlining the subjective and objective shot sizes and what should be in the frame. As I was going to film this project in our house, I sketched the storyboard with this setting in mind. I began by filming the subjective pov shots first, as I knew that would probably be the most demanding of the two views to capture and because it would be easier to retrace my steps for the objective view shots. As I was using camera handheld to capture the subjective pov shots, I decided to use a wide-angle lens as it would enable me to get wide general shots of the various rooms and move in closer on objects to give the viewer the impression of seeing through the eyes of the main character. Once I had captured the subjective pov shots, I then filmed the objective views within the hall, kitchen, bedroom and lounge. For each of these shots the camera was mounted on a tripod. Again, I decided to use a wide-angle lens in order to catch the action as the character searches for the missing key. When I began filming the subjective pov shot, it soon became apparent that using a camera as large as a Sony PXW-FS7 was going to be difficult. Trying to handhold the camera while attempting to capture the impression I was shooting through the eyes of the main protagonist, moving within the confined space of the house, changing levels (standing, bending down, kneeling), going in for close ups and keeping the camera steady, all while trying to keep the shot in focus, was physically demanding. I also realised I would have problems with high contrast, due to the amount of sunlight coming in through the windows. This was most problematic when moving the camera past a window, as it would burn out. This was particularly a problem in the final shot when opening the front door. There were also problems maintaining focus while walking along the hall, due to the shallow depth of field. Even after several attempts at filming this pov shot, I was unable to follow the focus while walking forward. In the end, I decided to stand at my end position at the door, set the focus, retrace my steps to my start position and then walk the length of the hall knowing at least the shot would end in focus as my had reaches for the door latch. A poor compromise, but at least the shot finishes in focus. I not entirely satisfied with the end result and don’t feel as though I have achieved as much as I had initially hoped with this project film. The film feels too loose and sloppy. This was my first attempt at using my FS7 handheld in this way. Not an easy approach to adopt with this camera, due to its size and weight. In retrospect, it may have been better to shoot with the camera shoulder mounted. It would be interesting to carry out another exercise in shooting subjective pov using both methods, handheld and shoulder mounted, to see what the effect on framing, angle and movement looks like in both cases. I did, however, find this project very enlightening. It has shown me that used sparingly and in the right places, the subjective pov shot can add considerably to a film. 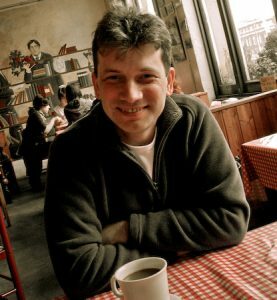 It can alter the meaning of a scene by changing the viewer’s relationship to the characters on screen, particularly the character through whose eyes they are ‘seeing’. It can also affect a scene by creating suspense or raising tension, which in turn affects the mood. I would like to try making another short film combining both a subjective point-of-view and an objective view in this way again. Though, in light of my reading about and looking at the work of filmmakers such as Jonas Mekas and Doug Atiken, I would like to make something that is more visually creative.